So what did I do in 2011???? Well . . . . Wow!!! What a year. I can not believe how much I have grown in quilting and how much Happy Quilting has grown. Thank you to all of you amazing readers that have made this year so incredibly fun for me. I just love making new friends through this amazing online community. 3 - Learn how to Paper Piece Semi Check - I did one Bee Block paper pieced and learned the basics, but I would like to learn a lot more. 4 - Learn how to Curve Piece Semi Check - I took a class on improv piecing where I learned how to do gentle curves but i have yet to tackle some drunkard path type curves. Check - I actually hosted 2 and I think both were very successful. I need to start planning another one. 8 - Continue designing for the Moda Bake Shop (I just love this so much, It is a definite keeper :) (And since I already have a project lined up for January I can check this off the list, Yippee Skippee) - Major Check - Me and the Moda Bake Shop are great friends, and I just love seeing your versions of my designs. 2 - Host 2 more Quilt-A-Longs, at least. I so loved having so many amazing quilter's sewing right a-long with me. I really want to make sure I leave time to do that again. 5 - Make some videos on free motion quilting. I just have to get over the fear of my voice on tape. 6 - Teach a class. Doesn't matter where, or to how many to ,preferably fewer, as the idea sort of scares and excites me at the same time. 7 - Start teaching my daughter to quilt. She is starting to show some interest and I want to make sure I set some time aside for her. 8 - Design and create for my family. Is it crazy that I made so many quilts in a year and only 1 of my children have a quilt I made for them on their bed?? (Although I have 2 in progress :) I want to focus on making these works of love for the people I love. 9 - Make Christmas Stockings for my family. Now that we know our family is not going to grow anymore I have no excuse not to make us a matching set of stockings. 10 - Keep Balance!!!! I want to really try to make sure I am on top of things enough to keep quilting time to nap time and bed time so that it doesn't interfere with family time. So here it goes!!! Bring on 2012!!!! I can't wait!!!!! Sounds wonderful! You sure were busy this past year! Don't know how you did it all and had a beautiful baby as well. Happy 2012 to you Melissa and all your loved ones. What a busy gal you are! Congrats on your goals!! Happy and productive new year!! Congratulations on being about-to-be-published! Yay for you! 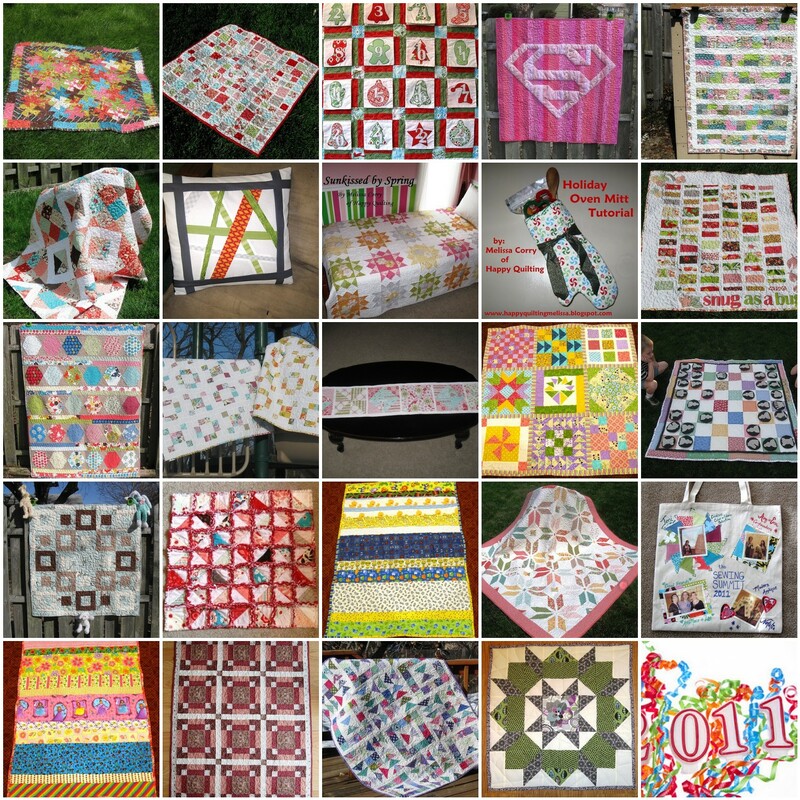 So much lovely quilting this year! You're invited to join our year-end link party at http://www.craftbuds.com/craft-buds-2011-year-in-review-link-party. Please join us if you'd like! You know how to get things done!!! Happy New Year! Congratulations on an amazingly productive year! It sounds as if you'll keep that momentum through 2012! Congrats on the soon-to-be-published pattern! You sew, girl! Melissa...you are an amazing woman with a super talent and sooooo productive. Your heart is in the right place with your family time being so important! Best wishes to you in the new year! Congratulations! I can't wait for the spring to see your magazine debut. It sounds like you had a great year. I'm sure you will be even more successful in 2012. Aw, the publication counts! It usually takes a bit after being accepted to get it on paper. I have a book chapter coming out early next year that I started two years ago :) It just takes a long, long time sometimes! Congratulations on being published in a magazine, I will watch this space for further details. I am not sure how I missed this post, but CONGRATULATIONS on reaching and exceeding so many of your goals!! You rock! I am SO excited to see this magazine in the spring!! Yay! !